What’s your excuse not to cycle to work? I once thought about cycling to work, this would have been sometime around 2009 and before my heart attack, I was living close to Heathrow airport and working in Central London approximately 20 – 25 miles away. Not enough time, I’ll be late. Thought dismissed as completely impracticable, although with hindsight they aren’t valid reasons not to cycle to work and are just excuses, the lot of them…..
Fast forward five years, post heart attack, it’s now 2014 and I’m still working in Central London once or twice a week, but now I’m living 120 miles away in Worcestershire. By this time I had been cycling for three years, fully addicted to it and looking at increasing my time in the saddle. Then I got an email at work saying that the company had signed up to the Cycle To Work Scheme, the website had a big banner with “Save up to 42% on a new bike!” emblazoned across it. It’s wasn’t long before that lost thought from 2009 resurfaced, You could cycle to work? After all you always need a new bike – except this time I really did live too far away. As a cyclist and recovered heart patient, I took the time to find the solutions to all of the excuses on my list and started cycling to work. If I can find a solution living 120 miles away from my place of work, I’m sure you can to. You don’t need to be cycling in everyday of the week, twice a week will bring the health benefits – try it you might actually enjoy it and end up a regular commuting cyclist. Life’s too short for regrets and if onlys, but if I did make a list of them dismissing that cycle to work thought in 2009 would certainly be towards the top – just take a minute to think about the health benefits 30 to 45 minutes of cycling a day would have made to my fitness and health, would I have had a heart attack at the age of 38? As the saying goes – “Where there’s a will there’s a way” – if you really want to do something you will find the time and the means to do it. 1 – I live too far away? Having moved to the Midlands my journey to work was slightly different now, but it still consisted of a short drive to a train station and tube journey across London. Cycling the entire distance was obviously completely impracticable and out of the question, but I could ride to and from the stations removing the car and tube from my journey. That was distance resolved, although it presented another problem with bikes on the train. My normal train would only take a few bikes and it was generally full each day, I ran the risk of getting to the station and not being able to get the bike in the carriage. I had seen other commuters carrying folding bikes onto the train and their small sixteen inch wheels are a regular sight on the streets of London. I’ve always been fascinated by the Brompton bicycle, especially watching other commuters folding them in seconds from a full bike to small neat square package. Decision made I got myself a Brompton on the cycle to work scheme. I can already hear the excuses starting – “That’s fine for you, I don’t travel by train to work, I have to drive in” – Well, I’ve thought about this one too and have a solution. In fact, I even used it myself for six months. The trains into London were getting expensive, I found it much cheaper (and surprisingly quicker somedays) to drive into London, park outside the congestion zone and cycle the last 3 miles to the office. Admittedly the Brompton does make it easier to get a bike into the boot of a car. If you are serious about wanting to cycle to work (you’ve read this far, so I take it you are) look at your current journey, could you park 3 to 5 miles away from work and cycle the last little bit? As you get stronger and fitter you can start parking further away and cycle more of it, you might even end up cycling the entire distance. You will also find that you start saving money, the further out of town you go the cheaper the parking charges will be and you will also be using less fuel. 2. City roads are too busy to cycle on. Once you take the plunge you’ll find it’s not that much different than anywhere else you ride, but the key is to find the quieter roads, cycle paths and lanes. Take Oxford Street as an example, it’s packed with buses, taxi’s, pedestrians and set after set of traffic lights. It was the most direct for me so I’ve cycled it many times and it’s certainly doable, although you do need your wits about you. If you take the roads that run parallel to it, you will find there’s much less traffic making it so much easier. As you can see from the two Strava rides below, the quieter roads extended my commute by less than a quarter of a mile and just over a minute. 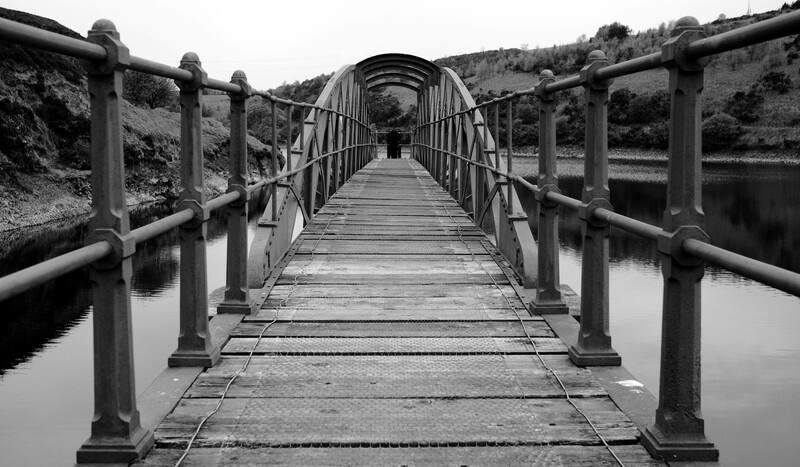 If you don’t know the area that well, take a look at a map from Ordnance Survey, check the route on a day off to make sure it’s suitable – you don’t want to find yourself cycling down a muddy bridleway on your way to work, coming home is a different story! The key here is to cycle at a slower pace, after all you are commuting to work and not racing for that PB (Personal Best) or KOM (King Of the Mountain) on a Strava segment. Easing off the pace will still increase your heart rate and be beneficial to your health, you just don’t build up a sweat. Take advantage of the time, it’s less stressful than driving and gives you time to clear your thoughts before you get to work, take the time and enjoy the ride. Plan your week in advance, carry a change of clothes with you or perhaps drive to work on Monday with your clothes for the week, cycle Tuesday to Thursday and then drive back in on the Friday to collect your kit. If you do carry your clothes try to avoid a rucksack on your back and opt for a bike that can carry your bag for you. Doing so stops you getting hot and sweaty behind the rucksack. You could also try products such as Muc-Off’s Dry Shower that you can use to freshen up when you get to work if you can’t get a shower, you’ll smell of coconut for the day, but that is preferable to the alternative. Speak to your colleagues and employer, if you can sell the benefits of cycling to work you might be able to convince them to install a shower. If they have signed up to a Cycle to Work scheme they probably already know the benefits a cycling workforce will bring them and may have already thought of adding showers. They might just need someone to show them there’s an actual need for them to do it. In my case, this just wasn’t an issue. It was actually quicker for me to cycle the 3 miles through Central London than to take public transport. One afternoon a colleague said that he could get from the office in Holborn to London Waterloo train station before me by taking the bus. Unfortunately it was a day that I didn’t have my bike with me, not a problem I said I’ll use a Boris Bike instead (a public hire scheme for bikes in London introduced by the Mayor Boris Johnson). I was a member of the scheme and had my access token with me – challenge accepted! We both left the office by the main entrance at exactly the same time, he headed off in the direction of the 521 bus whilst I walked to the nearest Boris Bike dock in a road behind the office. I didn’t do anything differently from normal and seven and a half minutes later I was docking my bike at Waterloo and texting my colleague to say I’ve arrived – I quickly got a text back saying that he was just about to cross the Thames and that he couldn’t believe I was already at the station. An easy win for me and the bike. You will find taking the quieter side roads and cycle paths will avoid most of the rush hour traffic, if you do come across queuing traffic you can normally easily pass it on a bike anyway. Having said that, you may find that it does take a little longer by bike, if it does the easy answer to this is to get up earlier! You will better for it in the long run. I’ve cycled in almost every type of weather there is, snow, rain, hail, sun, wind and even -3 degrees celsius at 3am in the morning on an overnight 100 mile charity cycle ride. I can say with confidence that there’s no such thing as the wrong type of weather, just the wrong type of clothing. Investing in various types of clothing is money well spent. The real tip is to wear layers, get a decent baselayer that will keep you warm and then add layers depending on what the weather is doing that day, such as a waterproof jacket if it’s raining. A cycling adage springs to mind – dress for the ride and not the car park – by that I mean think about what the weather is going to be like once you’ve warmed up and into the ride itself, wrapping up at the start might make you far too hot later on. I now love riding in the colder weather, it’s amazing how soon you warm up once you start exercising. If you’re still cold, you’re not pedalling hard enough! Now let me ask that first question again, What’s your excuse not to cycle to work? Tell me in the comments below or on Twitter and I’ll find a solution to it for you! If you had an accident whilst out cycling or running, do you have means of letting first responders know who you are and your emergency details? Would someone look through your jersey pockets or bags to find your ID? Given my medical history (see previous posts) its important, no vital, that if the unthinkable does happen to me that any first responders can be made aware of my history, medication and emergency contact details as fast as possible. Therefore, I’ve chosen to wear an engraved identification wristband, this is far more likely to be noticed before anything in your pockets. All of my information can easily be made available to any first responder by entering my serial number and personal identification number (from the back of my wristband) onto a website or over the telephone. If the first responder cannot access the internet or telephone, at least the first two lines of the wristband will let them know my name, age and that I have a heart condition. I’ve had my wristband and shoe IDs for over four years now, hopefully I will never need anyone to use them, but for a small annual fee I have that peace of mind that I and my medical notes can be identified at the road side. Various companies offer these types of wristband, who you choose is entirely up to you, I got mine from RoadID.com for less than £13, including the first years subscription. When you consider the price of most cycling accessories and components it’s next to nothing. The sport band is unobtrusive whilst riding, I don’t even notice or feel that I’m wearing it, yet it’s easily accessible to first responders. Even if you don’t have a medical history, I strongly recommend that you have some form of easily accessible identification for first responders. First things first, if you have any kind of heart condition talk to your Doctor before taking up any exercise. I don’t want to put anyone off, but all heart conditions are different and only you and your Doctor know your condition in any detail. This post is about my experiences and what worked for me, hopefully it will inspire others to start cycling to improve their health, but PLEASE always seek medical advice prior to starting any new exercise regime. I cannot stress this enough. If you have read my first post you will know that 4½ years ago I had a Myocardial Infarction (MI), more commonly known as a heart attack, and that I took up cycling again as a way to improve my fitness and overall heart health. I say took up again, that’s probably taking the phrase too far, as other than my morning paper round in the 1980’s I hadn’t done much cycling prior to my MI in 2011. My most active year on the bike prior to that was 2009 when I headed out just sixteen times over the summer. This was in a time before the likes of Strava so I recorded my rides in Excel, looking back I had clocked up a wapping 260 miles with an average speed of 11mph. I did actually ride with a heart rate monitor back then, my averages over those rides were: max heart rate (MHR) 172 and heart rate (HR) 140. The longest ride that year was the 45 mile Palace to Palace (Buckingham Palace to Windsor Castle) in aid of the Princes Trust. My family were shocked when I said I was entering. I took it easy for the first couple of weeks after being discharged from hospital before I started any real exercise. Initially by walking around the garden, increasing the distance each day until I felt I could manage a lap around the block. Within a couple more weeks I was walking into the local town centre to pick up a paper and pint of milk. It was twelve weeks before I felt comfortable venturing out on two wheels, I got the bike out of the shed, the first time it had seen daylight since Palace to Palace almost two years earlier. That first ride was a venture into the unknown – I don’t know who was more nervous at the time, me or my partner. I’m thinking, is this the right thing to do and would it bring on another MI, whilst Sue was at home thinking exactly the same whilst waiting for the phone to ring again….. I cycled 3.3 miles in 17 minutes (average speed 11mph, MHR 155 and average HR 135) probably one of the longest 17 minutes of Sue’s life. It’s not just about the person who has the heart condition, loved ones are affected just as much, if not more. For me those 3.3 miles / 17 minutes were the start of my return to cycling, this time it was serious. 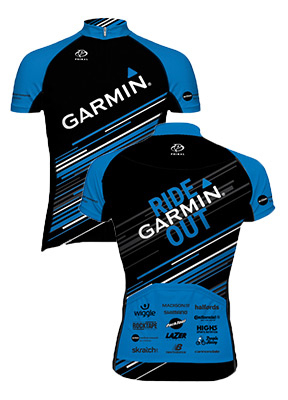 Over the next six months to the end of 2011 I was to cycle a further 1170 miles on my road to recovery, culminating in a 62 mile ride around the Isle of Wight (on a cold and windy day in December) in the Wiggle Wight Winter Sportive, details and full stats on Garmin Connect. Tackling a 62 mile ride just 9 months after a MI might seem a bit irresponsible, I didn’t just decide to ride this distance out of the blue. 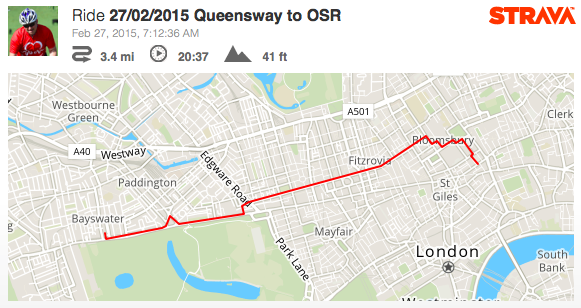 I had built up to this distance over time, regularly riding 11 miles during the week and 15 – 20 miles at the weekends. Leading up to the event I did a couple of 40 milers and a 50 mile ride. Obviously I don’t want another heart attack, so the most important item I ride with is a heart rate monitor. I bought a Garmin Edge head unit as I also wanted to record my routes as well as all the other stats. Just having the heart rate monitor isn’t enough, you need to understand your own heart, so much so that I became obsessed with it. I set about working out my MHR, I didn’t know there were so many different ways and views on how to calculate it, having spent ages with the various different formulas, collating all the results and then taking an average of them all my MHR should be 178.6 If you want to know what your MHR is, save all the complicated formulas and just subtract your age from 220. I’m 42 so my MHR is 178. Having a resting HR of 54 bpm is normally a sign of somebody who is very fit or a professional sportsperson – prior to my MI my resting HR was in the 70 to 80 range. I was doing a lot of cycling at the time, but I was still overweight with a 40 inch plus waist, so I wasn’t that fit! Having spoken to my Doctor my lower HR is a result of my medication, in this case a beta blocker called Bisoprolol Fumarate. Before the calls of “doper!”, I’ve checked all my medication against the WADA prohibited list for cycling in the UK and none of them are prohibited. Not that it matters as I cycle purely for fitness, but it’s nice to know I could compete if I wanted to. Now, archery is a different matter as the slower heart rate means you gain an advantage as you will have a steadier hand to hold the bow, thereby increasing your accuracy. I mention the effect of the beta blocker as if it effects my minimum HR I need to consider if it has a similar effect on my maximum. Therefore and to err on the side of caution I’ve set my MHR at 171. If you are starting out exercising speak to your Doctor, Cardiologist and/or Heart Failure/Rehab Nurse about what your heart rate should be. 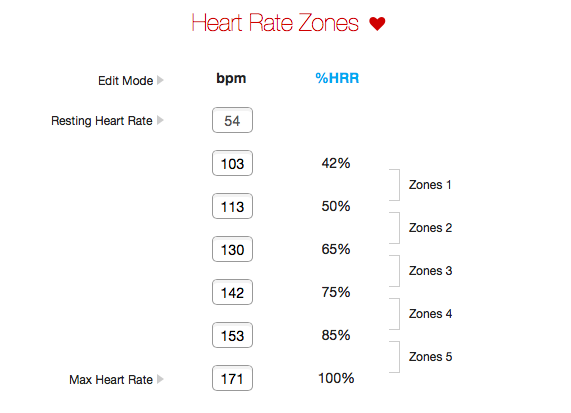 Knowing your min and max heart rates allows you to calculate your exercise zones, I do this through Garmin Connect but there are numerous websites available that you can use to calculate yours. When I started out cycling after the MI I would try and avoid going above 153 bpm (85% of MHR) which would give be a buffer up to 165 bpm and I would still be under by MHR. I probably have too much data on my Garmin training pages, although you will notice that every one shows my heart rate. I normally ride with the last page showing the graph and HR in bpm and %max. I’m quite happy to let it go up to the high 160’s now for short periods of time, but like to keep it below 85% for the majority of the ride. The point I’m trying to make is I know what my limit is, if I hit 172bpm my Garmin will alert me and it’s time to ease off, if that means getting off and walking up a hill, I get off and walk. I have no problem in getting off and walking, I would rather get to the top by walking than not at all. It does not matter what other people/riders think or say, it’s my heart and I would like to keep it. It’s only a hill, it will still be there the next day and the day after that, just make sure you are still here to attempt it again. Knowing my limits and training has allowed me to enjoy my cycling and improve my fitness. By pacing myself and utilising the gears/cadence to stay in the different heart rate zones I can now get up most hills without walking, occasionally one will still get the better of me. 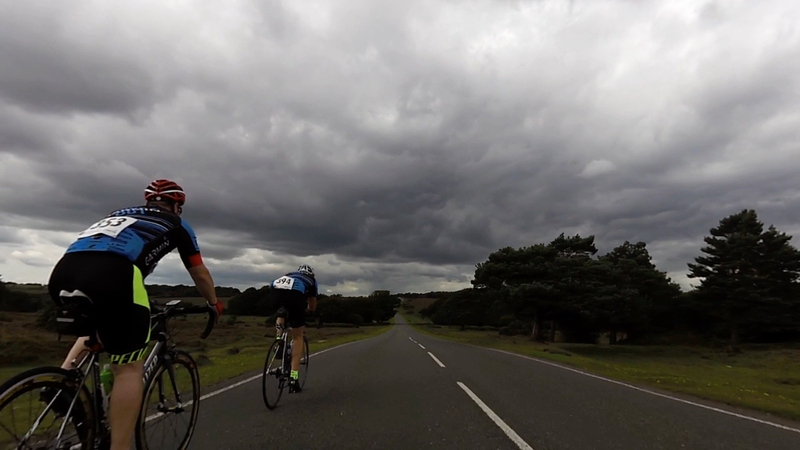 The photo below was taken almost one year to the day after my heart attack, yes that is me 45lbs lighter and climbing Blissford Hill (25% gradient) in the New Forest whilst staying under my self imposed 171 MHR limit. As I said at the very start of the post, if you have a heart condition please seek medical advice first, but I hope that my story has inspired you to consider cycling as a fitness option. Remember you don’t need to be doing 60 mile rides with lots of climbing, a regular easy spin around the block for twenty to thirty minutes three times a week could do wonders for you, just speak to your Doctor before you start.